Space: the eternal frontier. This is the story of admiral Reinhard von Lohengramm. His mission: to unite the war-torn galaxy under his rule, to reform the decaying Galactic Empire, to conquer what so many men dreamed of conquering before. Do you believe I can seize this universe and make it my own? More than 33 years have passed since Yoshiki Tanaka published the first volume of Ginga Eiyū Densetsu, or Legend of the Galactic Heroes. After its completion in 1987, the 10-part series was honored with a Seiun Award for the best science fiction novel and, over the course of the following decade, turned into an OVA spanning 110 episodes. Ambitious in matter, scope and release history, Legend of the Galactic Heroes is considered one of anime’s holy grails. And yet, neither the acclaimed novel nor the highly regarded OVA (complemented by additional movies and side stories) have been available to an English-speaking audience before Viz Media and Sentai Filmworks acquired the respective licenses in 2015. While the pressing question of “why now” might, from a sales perspective, be answered with a new anime adaptation in the making, the far more interesting question for the reader is undoubtedly: Is this story still relevant today? The short answer is “yes”, followed by an emphatic “maybe even moreso than 33 years ago”. 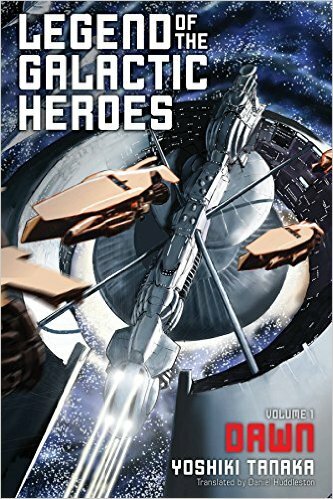 Set in the 36th century CE, Legend of the Galactic Heroes is a historical novel before it’s a science fiction one. The setting 1,500 years in the future is a double-edged sword. From the perspective of future history, it works in clear favor of suspending disbelief, with the history of humanity chronicled in the novel’s prologue feeling reasonably plausible. On the other hand, advancements in technology in the past decades make outmoded means of communication feel even more out-of-date. Dawn‘s prologue also serves as an introduction of the two warring nations inhabiting the planets of the Milky Way Galaxy. The autocratic Galactic Empire is an interesting conception of what a post-Bismarck Prussia might look like in future space, with all its hedonistic decadence and social injustice. In a society where women are little more than playthings for nobles, where power is inherited based on blood and status and not earned through merit, government is bound to end up in the hands of incompetent men, comfortably ruling on the backs of the common people. For commoners, war is an obligation, and while they are shipped out to be slaughtered in meaningless skirmishes, the same war is also the only means left for ambitious men to advance in society. Men like the brilliant young imperial admiral Reinhard von Lohengramm, who strives to create history by challenging the inertia of the war with the Free Planets Alliance and the Empire’s own pitiful state. Founded out of opposition to the Empire roughly 250 years prior to the beginning of the main storyline, the Free Planets Alliance resembles 20th century democracies of similar age – and with very similar problems. Birthed by great ideals of freedom and justice, it has long lost the vigor and idealism of its founding fathers, facing corruption, inefficiency and disillusionment. What’s left are the empty, but familiar platitudes of politicians much more concerned about their own political security than the lives of the people they owe their position to. It was in the defense of country and of freedom that they gave up their lives! Is there any death more worthy than this of the word ‘noble’? […]And what I want to say most loudly is this: that country and freedom are worth protecting, even at the cost of human lives. That our battle is a just one! […] We have a noble duty. A duty to bring down the Galactic Empire and rescue all humanity from its oppression. How can you say we’re walking in the path of righteousness if we, intoxicated with cheap humanitarianism, forget that great purpose altogether? The demagogy of politicians advocating a just cause to keep the war machine going and themselves in a position of power is as old as the existence of so-called civilized states, as young Alliance commodore Yang Wen-li cynically ponders between two equally meaningless battles. Though the ages turned, this outrageous correlation between those who made war and those who were made to make war had not improved in the slightest since the dawn of civilization. If anything, the kings and champions of the ancient world may have been slightly better – if only on the point of having stood themselves at the heads of their armies, exposing their own skins to the threat of physical harm. Power is an alien desire to Yang, who would much rather be an observer than a creator of history. But with the Alliance equally plagued by incompetence as the Empire, Yang’s unique tactical talent will deny him the luxury of a quiet, uneventful life. Just as the Empire is aching for a new star to unite under, the Alliance needs a fresh idol for its citizens to stay committed to the cause after the war effort has brought the nation to its knees. In order to wipe out such a blot of disgrace and dishonor, the leadership needed a military hero. Needless to say, Reinhard and Yang are destined to become each others’ nemeses, and the epic battles of these galactic heroes are likely to change the course of history over the subsequent volumes. Legend of the Galactic Heroes is a firm believer in historic recurrence and humanity being bound to repeat the mistakes of the past just by being human and, therefore, flawed. But despite the deliberately dramatic title, Tanaka doesn’t tell a story about how the world was shaped by Great Men and their glorious battles. In fact, his series could much easier be interpreted as a warning of the dangers of proclaiming powerful men heroes in times of crises. Exhibit A: the emergence of the Galactic Empire from social and political turmoil, as detailed in the novel’s prologue. They believed that drastic treatment of humanity’s collective illness was needed, and in this they were not mistaken. But when they selected their favored form of medication, the majority opted not for the kind of long-term therapy that requires endurance and perseverance – instead, they quaffed a fast-acting elixir that came with many side effects. This was the powerful drug called “dictatorship.” And so the stage was set for the ascent of Rudolf von Goldenbaum. Founder of the Galactic Empire, Rudolf von Goldenbaum was one of those strong, great men who change history. He was also a despot and shining example of why it is such a bad idea to put all the power into one man’s hands. Autocratic rule and absolute dictatorship are almost universally considered to be haunting relics of the past in modern democracies. But people have a troublesome tendency to lose their ability to reflect upon the usually multifaceted reasons behind the crisis they’re facing and turn to the strong men to deliver them from their fears. Fundamentally, people do not prefer independent thought and the accompanying responsibility, but rather orders, subordination, and the accompanying exemption from responsibility. In a time where the US presidential election campaign runs almost exclusively on fear (and advertising an easy treatment thereof) and new right wing splinter parties emerge in a European Union self-destructing under the reality and pretext of external threats, Yoshiki Tanaka’s commentary about humanity’s ingrained destructive potential couldn’t be more relevant. When Yang’s father explains to his son why Rudolf, the villain, could ever rise to absolute power, the message hits home loud and clear. It’s the ones who empower a dictator who deserve most of the blame. But the ones who don’t support him actively – who watch it happening without saying anything – they’re just as much to blame. Legend of the Galactic Heroes: Dawn isn’t subtle about its convictions. It’s an angry, but, in all its cynicism, honest advocate of the power of reason over the seductive nature of hero worship. It’s timeless in the same way history is bound to repeat itself in a never-ending cycle of destruction and rebirth, and war has been a part of this cycle for as long as humanity has a history. Tanaka’s detached, matter-of-fact depiction of the horrors of war might make his message less effective on an emotional level, but all the more powerful to establish a world where human lives have become mere resources in a game of war that has long become an end in itself. The effect of victory was lessened in inverse proportion to mounting losses. It was in finding the point that made both propositions compatible that tactics as a discipline found its raison d’être. In other words, it meant getting the maximum effect for the minimum losses, or to put it more coldly, finding the most efficient ways to murder your comrades. From time to time, a strategic genius or tactical magician might emerge from the vicissitudes of history, and if humanity is lucky, its current hero will turn out to be a capable leader instead of a corruptible demagogue or power-hungry lunatic. But even if this is the case, honor and glory will always be “built only atop the piled corpses of unknown soldiers”. War does not create heroes. People do. Legend of the Galactic Heroes is relentless in exposing the horrors of war and damnable decadence of the empire’s autocratic regime, but Tanaka is unbiased in his equally harsh critique of fighting for the just, democratic cause. Aiming to liberate the galaxy of the evils of autocracy, the Alliance and its citizens are paying a heavy price for their self-imposed role as the savior, delivering the world to democracy. Oceans of bloodshed, national bankruptcy, impoverished masses. If sacrifices such as these were essential to realizing justice, then Justice looked like a greedy god indeed, tirelessly demanding one sacrificial victim after another. The cynicism of this bloody equation is even more caustic on the side of the people brought into the fold of democracy without being asked for their opinion. When the Alliance liberates another planet from the grasp of the Empire, it turns out lofty ideals are much less essential to the life of the newly freed than the fulfillment of basic needs. Frustration sets in quickly on the sides of both the saved and the saviors when it becomes clear that the oppressed were not actually sitting around, waiting to be saved. Before you promise freedom and equality, can you promise bread and milk? Despite some unfortunate quality control hiccups in the translation, with typographical errors especially irritating in character names, I’m grateful for finally being able to follow Reinhard and Yang’s ideological and military conflicts in written and, soon, animated form. Legend of the Galactic Heroes offers a brutal, honest take on the space opera military epic, unmasking the glory of sacrifice for the political scheming it often is. Dawn is only the first of ten volumes, and it’s not even guaranteed if and when we will see the release of novels 4-10, as only the second and third volumes have been announced so far. But this first installment sets the stage for an epic war not between the evil space empire and the heroic alliance liberation force we’re so used to see in this kind of story, but between differently flawed governmental systems, run by differently flawed human individuals, driven by a multitude of personal and political motivations I can’t wait to learn more about. The galaxy turned, carrying with it thoughts, beliefs, and hopes beyond number. This review was written for the Anime Herald in May, 2016.